Something pretty grim must have taken place in our garden in the early hours of Saturday morning. When we went outside to breakfast in the pale sunshine of an English summer morning, we found a perfect young female blackbird dead on the lawn. A few metres away were the scattered feathers of a male with more under the mulberry tree. Who was responsible for this carnage? A sparrowhawk? One of the evil cats that stalk our quiet road? For me the blackbird’s song is the sound of summer. That melodic trilling they do when seeking a mate is so evocative of warm summer evenings, of peace after a long day, of lying in bed as a child while it’s still light outside. To see a dead blackbird with its song forever stilled is heart-breaking. Here’s my contribution to Draw-a-Bird Day, which happens every month on the 8th. 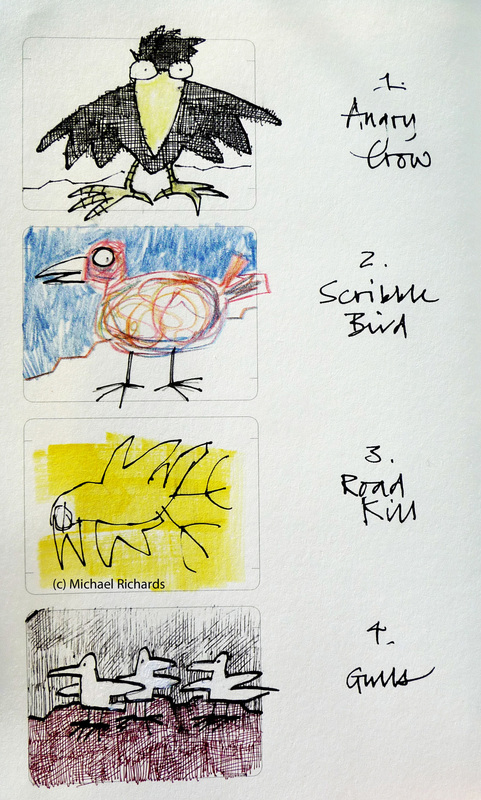 One month I’ll draw a ‘proper’ bird – mine always seem unconvincing, like they’re made out of painted concrete or something – but here are some that I did to test a Moleskine storyboard notebook. ‘Angry crow’ is almost tautologous: have you ever seen a crow that isn’t highly annoyed about something or other? 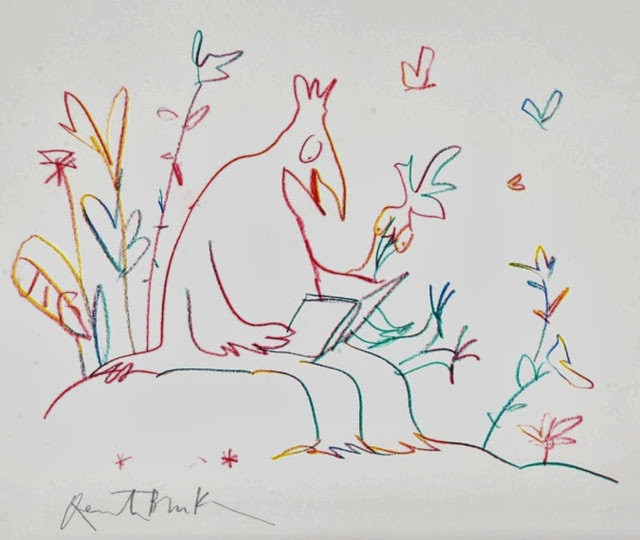 The Scribble Bird was drawn with one of those multi-coloured pencils you see in museums (Quentin Blake actually does beautiful drawings with those things). Road Kill is self-explanatory and the Gulls owe something to my new hero, Felix Scheinberger, who wrote a whole textbook on illustration in German themed around birds. I hope you’re as happy as a seagull with a stolen chip. Love your birds! But the horror of your story: yikes. Picked up “The Art of Richard Thompson” on your recommendation. It’s a wonder. I love hearing the voices of these other artists describing his art! I’ll be taking a close look to see how he develops his ideas so clearly. Thanks, Michael. Oh terrific! I’m so pleased you enjoyed “The Art of Richard Thompson”, Kirk. There’s so much life in every line, as I said. He seemed to have such control over the ever-unpredictable dip pen! 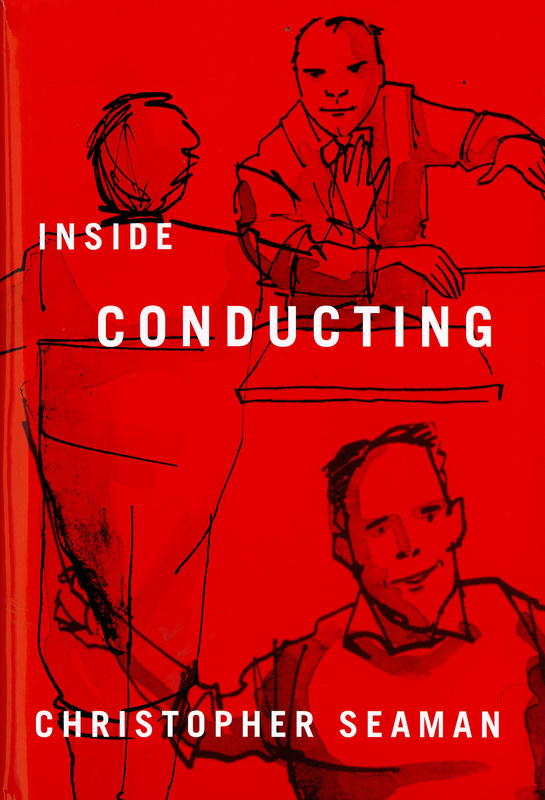 Such a loss to the noble art of cartooning and illustration. Yikes to the story of the blackbirds… a definite mystery there. I’m thinking it was the evil cats. Your bird roundup is awesomely fun! Love these! Yes those felines are high on my suspect list, believe me! Glad you like the birds too. You made me grin eith your dead one, despite the awful origins of the idea. But your drawing was funny! I love my kohinoor Magic pencils, which are probably what Quentin has. Are those what you have? Lynne Chapman (co uk) uses them a lot in urban sketching and they are a real boon. Thanks, Eleanor! That’s interesting,I thought I just had magic pencils from the Courtauld Institute and the Royal Academy, but I now see that the latter is indeed Koh-I-Nor brand. As a stationery nerd I find that fascinating! I love the crow especially… don’t love the sad story but I guess that is how nature works. Thank you. Yes, the blackbird slaughter was terribly sad. They’re probably my favourite bird because of their beautiful song. I like your road kill one – made me laugh! I always feel sad when a healthy bird is killed. Sometimes nature is unkind. Thank you, Jill. Nature is tough, indeed. What I find interesting is that more birds are kiled on country lanes than on motorways, because birds have learned to steer clear of the latter. These are great, Michael! All fun, but I think my favourite is the mischievous, beaky gulls. Chips indeed. Perfectly illustrated! Thanks Jacob. Obviously Russian crows are jollier than the ones in the west! This gave me a flash back to when I was in primary school an the head teacher took our class for the day and drew loads of birds in a cartoon kind of style on the blackboard. It was, for me, such a memorable lesson. Love this style and your handwriting! Thank you. I can draw cartoon birds and dogs until the proverbial cows come home! What a cool head teacher. My primary school head was like Medusa! It would have definately been the Cats, who got the birds. Cats hate to be disturbed and those birds must have disturbed his sleep.